The main reason for doing earthing in electrical network is for the safety. When all metallic parts in electrical equipments are grounded then if the insulation inside the equipments fails there are no dangerous voltages present in the equipment case. If the live wire touches the grounded case then the circuit is effectively shorted and fuse will immediately blow. When the fuse is blown then the dangerous voltages are away. To protect buildings, machinery & appliances under fault conditions. To ensure that all exposed conductive parts do not reach a dangerous potential. To provide safe path to dissipate lightning and short circuit currents. To provide stable platform for operation of sensitive electronic equipments i.e. To maintain the voltage at any part of an electrical system at a known value so as to prevent over current or excessive voltage on the appliances or equipment . Lightning, line surges or unintentional contact with higher voltage lines can cause dangerously high voltages to the electrical distribution system. Earthing provides an alternative path around the electrical system to minimize damages in the System. There are many sources of electricity. Every transformer can be considered a separate source. If there were not a common reference point for all these voltage sources it would be extremely difficult to calculate their relationships to each other. The earth is the most omnipresent conductive surface, and so it was adopted in the very beginnings of electrical distribution systems as a nearly universal standard for all electric systems. Plate burred at the depth of 8 feet in the vertical position and GI strip of size 50 mmx6 mm bolted with the plate is brought up to the ground level. These types of earth pit are generally filled with alternate layer of charcoal & salt up to 4 feet from the bottom of the pit. GI pipe [C-class] of 75 mm diameter, 10 feet long welded with 75 mm diameter GI flange having 6 numbers of holes for the connection of earth wires and inserted in ground by auger method. These types of earth pit are generally filled with alternate layer of charcoal & salt or earth reactivation compound. Excavation on earth for a normal earth Pit size is 1.5M X 1.5M X 3.0 M.
Use 500 mm X 500 mm X 10 mm GI Plate or Bigger Size for more Contact of Earth and reduce Earth Resistance. Wood Coal Powder use as good conductor of electricity, anti corrosive, rust proves for GI Plate for long life. The purpose of coal and salt is to keep wet the soil permanently. The salt percolates and coal absorbs water keeping the soil wet. Care should always be taken by watering the earth pits in summer so that the pit soil will be wet. Coal is made of carbon which is good conductor minimizing the earth resistant. Salt use as electrolyte to form conductivity between GI Plate Coal and Earth with humidity. Sand has used to form porosity to cycle water & humidity around the mixture. Put GI Plate (EARTH PLATE) of size 500 mm X 500 mm X 10 mm in the mid of mixture. Use Double GI Strip size 30 mm X 10 mm to connect GI Plate to System Earthling. It will be better to use GI Pipe of size 2.5″ diameter with a Flange on the top of GI Pipe to cover GI Strip from EARTH PLATE to Top Flange. Cover Top of GI pipe with a T joint to avoid jamming of pipe with dust & mud and also use water time to time through this pipe to bottom of earth plate. Maintain less than one Ohm Resistance from EARTH PIT conductor to a distance of 15 Meters around the EARTH PIT with another conductor dip on the Earth at least 500 mm deep. Check Voltage between Earth Pit conductors to Neutral of Mains Supply 220V AC 50 Hz it should be less than 2.0 Volts. It is the resistance of soil to the passage of electric current. The earth resistance value (ohmic value) of an earth pit depends on soil resistivity. It is the resistance of the soil to the passage of electric current. It varies from soil to soil. It depends on the physical composition of the soil, moisture, dissolved salts, grain size and distribution, seasonal variation, current magnitude etc. In depends on the composition of soil, Moisture content, Dissolved salts, grain size and its distribution, seasonal variation, current magnitude. Different soil conditions give different soil resistivity. Most of the soils are very poor conductors of electricity when they are completely dry. Soil resistivity is measured in ohm-meters or ohm-cm. Soil plays a significant role in determining the performance of Electrode. Soil with low resistivity is highly corrosive. If soil is dry then soil resistivity value will be very high. If soil resistivity is high, earth resistance of electrode will also be high. Moisture has a great influence on resistivity value of soil. The resistivity of a soil can be determined by the quantity of water held by the soil and resistivity of the water itself. Conduction of electricity in soil is through water. Pure water is poor conductor of electricity. Resistivity of soil depends on resistivity of water which in turn depends on the amount and nature of salts dissolved in it. Small quantity of salts in water reduces soil resistivity by 80%. common salt is most effective in improving conductivity of soil. But it corrodes metal and hence discouraged. Increase or decrease of moisture content determines the increase or decrease of soil resistivity. Thus in dry whether resistivity will be very high and in monsoon months the resistivity will be low. Different soil composition gives different average resistivity. Based on the type of soil, the resistivity of clay soil may be in the range of 4 – 150 ohm-meter, whereas for rocky or gravel soils, the same may be well above 1000 ohm-meter. The location also contributes to resistivity to a great extent. In a sloping landscape, or in a land with made up of soil, or areas which are hilly, rocky or sandy, water runs off and in dry weather conditions water table goes down very fast. In such situation Back fill Compound will not be able to attract moisture, as the soil around the pit would be dry. The earth pits located in such areas must be watered at frequent intervals, particularly during dry weather conditions. Though back fill compound retains moisture under normal conditions, it gives off moisture during dry weather to the dry soil around the electrode, and in the process loses moisture over a period of time. Therefore, choose a site that is naturally not well drained. Grain size, its distribution and closeness of packing are also contributory factors, since they control the manner in which the moisture is held in the soil. Effect of seasonal variation on soil resistivity: Increase or decrease of moisture content in soil determines decrease or increase of soil resistivity. Thus in dry weather resistivity will be very high and during rainy season the resistivity will be low. Soil resistivity in the vicinity of ground electrode may be affected by current flowing from the electrode into the surrounding soil. Single electrode rod or strip or plate will not achieve the desired resistance alone. If a number of electrodes could be installed and interconnected the desired resistance could be achieved. The distance between the electrodes must be equal to the driven depth to avoid overlapping of area of influence. Each electrode, therefore, must be outside the resistance area of the other. The soil may look good on the surface but there may be obstructions below a few feet like virgin rock. In that event resistivity will be affected. Obstructions like concrete structure near about the pits will affect resistivity. If the earth pits are close by, the resistance value will be high. A current of significant magnitude and duration will cause significant drying condition in soil and thus increase the soil resistivity. For measuring soil resistivity Earth Tester is used. It is also called the “MEGGER”. It has a voltage source, a meter to measure Resistance in ohms, switches to change instrument range, Wires to connect terminal to Earth Electrode and Spikes. It is measured by using Four Terminal Earth Tester Instrument. The terminals are connected by wires as in illustration. P=Potential Spike and C=Current Spike. The distance between the spikes may be 1M, 2M, 5M, 10M, 35M, and 50M. All spikes are equidistant and in straight line to maintain electrical continuity. Take measurement in different directions. R= Value of Earth resistance in ohm. Distance between the spikes in cm. P = Earth resistivity ohm-cm. In this method earth tester terminal C1 & P1 are shorted to each other and connected to the earth electrode (pipe) under test. Terminals P2 & C2 are connected to the two separate spikes driven in earth. These two spikes are kept in same line at the distance of 25 meters and 50 meters due to which there will not be mutual interference in the field of individual spikes. If we rotate generator handle with specific speed we get directly earth resistance on scale. Spike length in the earth should not be more than 1/20th distance between two spikes. 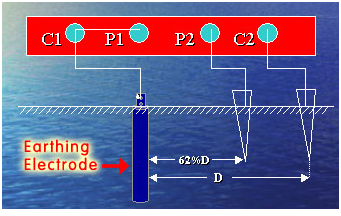 Resistance must be verified by increasing or decreasing the distance between the tester electrode and the spikes by 5 meter. Normally, the length of wires should be 10 and 15 Meter or in proportion of 62% of ‘D’. Suppose, the distance of Current Spike from Earth Electrode D = 60 ft, Then, distance of Potential Spike would be 62 % of D = 0.62D i.e. 0.62 x 60 ft = 37 ft. In this method 4 spikes are driven in earth in same line at the equal distance. Outer two spikes are connected to C1 & C2 terminals of earth tester. Similarly inner two spikes are connected to P1 & P2 terminals. Now if we rotate generator handle with specific speed, we get earth resistance value of that place. In this method error due to polarization effect is eliminated and earth tester can be operated directly on A.C.
As per IS 3043, the resistance of Plate electrode to earth (R) = (r/A) X under root(P/A). Where r = Resistivity of Soil Ohm-meter. A=Area of Earthing Plate m3. The resistance of Pipe electrode to earth (R) = (100r/2πL) X loge (4L/d). d=Diameter of Pipe/Rod in cm. The resistivity of the soil and the physical dimensions of the electrode play important role of resistance of Rod with earth. The material resistivity is not considered important role in earth resistivity. Any material of given dimensions would offer the same resistance to earth. Except the sizing and number of the earthing conductor or the protective conductor. The resistance of Pipe electrode to earth (R) = (100r/2πL) X loge (4L/d) = (100X100/2X3.14X300) X loge (4X300/5) =29.09 Ohm. From the above calculation the GI Pipe electrode offers a much lesser resistance than even a copper plate electrode. As per IS 3043 Pipe, rod or strip has a much lower resistance than a plate of equal surface area. The resistance to earth of a pipe or plate electrode reduces rapidly within the first few feet from ground (mostly 2 to 3 meter) but after that soil resistivity is mostly uniform. After about 4 meter depth, there is no appreciable change in resistance to earth of the electrode. Except a number of rods in parallel are to be preferred to a single long rod. To reduce soil resistivity, it is necessary to dissolve in the moisture particle in the Soil. Some substance like Salt/Charcoal is highly conductive in water solution but the additive substance would reduce the resistivity of the soil, only when it is dissolved in the moisture in the soil after that additional quantity does not serve the Purpose. 5% moisture in Salt reduces earth resistivity rapidly and further increase in salt content will give a very little decrease in soil resistivity. The salt content is expressed in percent by weight of the moisture content in the soil. Considering 1M3 of Soil, the moisture content at 10 percent will be about 144 kg. (10 percent of 1440 kg). The salt content shall be 5% of this (i.e.) 5% of 144kg, that is, about 7.2kg. Moisture content is one of the controlling factors of earth resistivity. Above 20 % of moisture content, the resistivity is very little affected. But below 20% the resistivity increases rapidly with the decrease in moisture content. If the moisture content is already above 20% there is no point in adding quantity of water into the earth pit, except perhaps wasting an important and scarce national resource like water. Apart from considerations of mechanical strength, there is little advantage to be gained from increasing the earth electrode diameter with the object in mind of increasing surface area in contact with the soil. The usual practice is to select a diameter of earth electrode, which will have enough strength to enable it to be driven into the particular soil conditions without bending or splitting. Large diameter electrode may be more difficult to drive than smaller diameter electrode. The depth to which an earth electrode is driven has much more influence on its electrical resistance characteristics than has its diameter. Major power station= 0.5 Ohm. Remove Oxidation on joints and joints should be tightened. Poured sufficient water in earth electrode. Used bigger size of Earth Electrode. Electrodes should be connected in parallel. Earth pit of more depth & width- breadth should be made. According to NEC 450.4, “each transformer 600 volts, nominal, or less shall be protected by an individual over current device installed in series with each ungrounded input conductor. Such over current device shall be rated or set at not more than 125% of the rated full-load input current of the auto transformer. Further, according to NEC Table 450.3(B), if the primary current of the transformer is less than 9 amps, an over current device rated or set at not more than 167% of the primary current shall be permitted. Where the primary current is less than 2 amps, an over current device rated or set at not more than 300% shall be permitted. Example: Decide Size of circuit breaker (over current protection device) is required on the primary side to protect a 75kva 440v-230v 3ø transformer. 75,000va / (440V x √3) = 98.41 amps. The current (amps) is more than 9 amps so use 125% rating. Use 125amp 3-pole circuit breaker (the next highest fuse/fixed-trip circuit breaker size per NEC 240.6). The over current device on the primary side must be sized based on the transformer KVA rating and not sized based on the secondary load to the transformer. According to NEC Table 450.3(B), where the secondary current of a transformer is 9 amps or more and 125% of this current does not correspond to a standard rating of a fuse or circuit breaker, the next higher standard rating shall be required. Where the secondary current is less than 9 amps, an over current device rated or set at not more than 167% of the secondary current shall be permitted. Example: Decide Size of circuit breaker (over current protection device) is required on the secondary side to protect a 75kva 440v-230v 3ø transformer. We have Calculate the secondary over current protection based on the size of the transformer, not the total connected load. 188.27 amps x 1.25 = 235.34 amps. Therefore: Use 300amp 3-pole circuit breaker (per NEC 240.6). For primary and secondary protection with a transformer impedance of 6% or less, the primary fuse must not be larger than 300% of primary Full Load Amps (F.L.A.) and the secondary fuse must not be larger than 250% of secondary F.L.A. For primary protection only, the primary fuse must not be larger than 125% of primary F.L.A. For primary and secondary protection the primary feeder fuse must not be larger than 250% of primary F.L.A. if the secondary fuse is sized at 125% of secondary F.L.A. NEC, Section 230-95(Ground-Fault Protection of Equipment). This section show that 277/480 volt “wye” only connected services, 1000 amperes and larger, must have ground fault protection in addition to conventional over current protection. The ground fault relay (or sensor) must be set to pick up ground faults which are 1200 amperes or more and actuate the main switch or circuit breaker to disconnect all ungrounded conductors of the faulted circuit. NEC, Section 110-9 – Interrupting Capacity. Any device used to protect a low voltage system should be capable of opening all fault currents up to the maximum current available at the terminal of the device. Many over current devices, today, are used in circuits that are above their interrupting rating. By using properly sized Current Limiting Fuses ahead of these devices, the current can usually be limited to a value lower than the interrupting capacity of the over current devices. NEC, Section 110-10 – Circuit Impedance and Other Characteristics. The over current protective devices, along with the total impedance, the component short-circuit withstand ratings, and other characteristics of the circuit to be protected shall be so selected and coordinated so that the circuit protective devices used to clear a fault will do so without the occurrence of extensive damage to the electrical components of the circuit. In order to do this we must select the over current protective devices so that they will open fast enough to prevent damage to the electrical components on their load side.